But and if ye should suffer for righteousness’ sake, blessed are ye: and fear not their fear, neither be troubled; but sanctify in your hearts Christ as Lord: being ready always to give answer to every man that asketh you a reason concerning the hope that is in you, yet with meekness and fear (1 Peter 3:14-15). We live in a world of religious confusion. There are all kinds of religions which teach and practice all kinds of things, and plenty of people who profess to have no religion whatsoever. Furthermore, confusion reigns among all the various groups who profess Christianity. All kinds of denominations exist today, all of them teaching different doctrines and practices, and all claiming to present God’s truth. In this climate of confusion, many ask difficult questions. What is the truth? Can it even be known? How tragic it is that so many despair of ever knowing the truth of God! I believe that the truth can be known, and the truth is present completely and infallibly in the revealed Word of God, the Bible. I will attempt in the study that follows to present what God has revealed to be the truth. Before we begin this journey, however, I would like to present some explanations of this study and some general thoughts. Any attempt to synthesize and explain the various beliefs of hundreds of groups presents many logistical challenges. The study has been divided into four parts. Part I involves discussions of denominations. Part II speaks of the various movements that have developed within Christianity, especially in the past two centuries, since many movements now transcend denominational boundaries. Part III represents certain practices and doctrines that come up consistently. Part IV involves early movements in Christianity, and demonstrates how history tends to repeat itself. In each entry in parts I and II, there is a section entitled “general considerations” referring you to the associated movements, doctrines, and practices of the denomination that are covered in other parts. The “general considerations” section also will cover doctrines and practices of a denomination covered in the section of another denomination. Some denominations have their own sections; many other times, however, different denominations who share the same heritage, beliefs, and practices on the whole are addressed together. This study presents basic information on denominational beliefs and practices, basic responses to these beliefs and practices, and basic defenses for the teachings of the Scriptures. This study does not present an exhaustive history and background of the denominations, nor does it set out to present everything that every denomination believes and teaches. You will notice that matters of marriage, divorce, and remarriage are not even addressed in this book; that is a study in and of itself, and that just among churches of Christ, let alone among other groups. Other issues are left unaddressed. This website is intended to be a handy reference and general guide for Christians as they strive to talk to people in their lives about matters of faith. It would take a large series of books to fully treat every denomination with its beliefs and practices and to present a full refutation. I freely encourage you to seek out other resources, written both by myself and others, to provide further and more in-depth guidance in speaking with members of denominations. This study is “a” study of denominations, not “the” study of denominations. In the end, this study is my study into denominations and their beliefs and practices, and represents my views. I have attempted to make sure that what I present in here concords to the message of the Scriptures, but that does not mean that you should take my word for it. I encourage you to also seek out these things in the Scriptures and see what is so (cf. Acts 17:10-11). I do not, nor ever would, presume to speak for churches of Christ in general, or even for the local church of which I am a part. I speak only as myself based on my research and experiences in defending the faith and promoting the truth. This study presents what denominations say they believe in their official literature. Just as members of churches of Christ dispute over various contentious matters, so also many matters are under dispute in various denominations. Furthermore, just as many members of churches of Christ do not really know what they believe or do not practice what they believe (to their shame), even more members of denominations do not really know what they believe or do not practice what they believe. I have done the best that I can through my research to present accurately what the denominations teach; do not assume, however, that just because a person you know is, say, a Lutheran, that they even know what the Lutheran church teaches on a given subject. Knowing the material present in this book will help you be able to communicate with members of denominations, but it is not wise to presume that since a person goes to a particular denominational church that they believe everything that denomination teaches. This study is designed to demonstrate how teachings of denominations diverge from the Scriptures; it is not my place to judge. So then each one of us shall give account of himself to God (Romans 14:11-12). We are called upon to test the spirits (1 John 4:1), and not to accept that which is false (Revelation 2:2). God, however, is the Judge of mankind, and only He has the prerogative to redeem or to condemn. We can encourage members of denominations to consider our defense and exhort them to consider the Scriptures, but in the end God will judge them as He will judge us. Will members of denominations be going to Hell for what they have believed and taught? That is God’s decision, not mine or yours or anyone else’s. The study is designed to encourage and instruct Christians. It will benefit you little if it is not used. Furthermore, it may assist you in your understanding, but if you do not take the knowledge gained and use it profitably to help instruct those around you, then the study is not reaching its full potential. 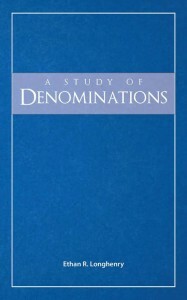 A Study of Denominations is written by Ethan Longhenry, who currently serves as the evangelist for the Venice church of Christ in Los Angeles, California. He has also written Churches of the New Testament, and was a contributor to Beneath the Cross: Essays and Reflections on the Lord’s Supper and People of the Past With Lessons for Today. He maintains the devotional Spiritual Manna and is the editor of Renewed in Spirit. He has also written for other publications including Biblical Insights, Expository Files, and Truth Magazine. His other online projects include de Verbo vitae, his website presenting other spiritual material for your encouragement, and The Word Online Bible Courses, a series of online courses designed to instruct participants in the Bible and Christianity. You can now order A Study of Denominations for your library! It is available in hardcover through DeWard Publishing, Ltd. Order here!